The city's plan to turn a large part of the so-called Public Place between Smith Street and the Gowanus Canal into housing is not winning friends in the neighborhood. The site is one of the most contaminated in South Brooklyn, having served as the home of a manufactured gas plant for nearly a century. MGPs, as they were called, left behind a deeply toxic legacy including coal tar. Contamination on the site runs as deep as 150 feet. Toxins are seeping into the Gowanus Canal. The city presented plans for the 11.5 acre site that include up to 600 new units of housing in townhomes and a building of up to 12 stories. An article in the Park Slope Courier details the hostile reaction of many communty members at a recent meeting of Community Board 6, particularly to what is viewed as the formulation of plans with little public input. There is signficant community opposition to building housing on the site both because of concerns about congestion and questions about the safety of people living on a deeply contaminated parcel which it will be possible to only partially clean up. The toxins would be sealed with a protective membrane and environmental experts says they are only a risk if one comes in contact with contaminated soil or groundwater. The city's plans are so far advanced that it intends to try to find a developer for the site by the second quarter of the year. Construction on the cleaned up toxic site could start as early as 2009. 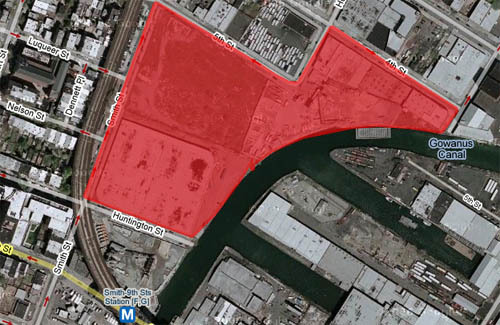 The big parcel is divided into four sections, with the most severe contamination under currently empty land. A second segment that is currently occupied by a concrete plant is also believed to be seriously polluted. The site is comprised of a total of four parcels, with the majority if the contamination found on the first, which is vacant, and second, which is leased by the city to a cement plant. The third lot is a clothing distribution warehouse and the fourth is home to a truck maintenance facility and commercial truck lot. KeySpan is responsible for cleaning the site. Although contamination is as deep as 150 feet, soil would only be removed to a depth of about eight feet. This is similar to a cleanup done at the site of a Lowe's store that was also the site of a gas plant. Another former gas plant site is now the site of a park, including a playground. The extent of toxic contamination there has never been measured. It's the Thomas Greene Playground. See this post. I would like to see the Gowanus area cleaned up properly before housing is built on it too. But I would like to see it cleaned up, and housing built. it seems like some of the detractors (not necessarily Gowanus Lounge) would rather not see housing there at all. I don't think it is a rearguard action about keeping Gowanus sleazy, etc. I think some action is warranted to put the brakes on rampant, unsafe construction by unscrupulous developers who do not build anything of quality, integrity or for lack of a better word, soul. Watching recent contruction in my neighborhood by JJ Byrne Park has been enlightening -- tenants and owners move in only to find unfinished work or shoddy work -- one building had to have all the windows redone because no one "remembered" to waterproof them so everyone had their own personal fountains in every room. Prices -- astronomical for the crap it is and people move in not knowing any better and without any advance knowledge how dense the population is getting w/o any increase in services. For example -- where are the new schools to take in the burgeoning population? Where is the planning to handle the new traffic caused by more residential buildings and superstores like Lowes and soon Whole Foods. Go on some of the side streets like 2nd & 3rd Street where new blocks of buildings have been constructed and see the caved in streets caused by the construction that the city hasn't repaired after 2 years. Let's face it -- Brooklyn is the unspoiled maiden that is getting raped by money-hungry developers from Ratner to Boymelgreen, rooted on by Markowitz and his cronies. Everyone in Brooklyn should feel uncomfortable because it is becoming 24/7 construction without regard to residents already here and without any planning for the growth and demand for services by an increasing population.